Recent arrivals of a Candy Stripe shape 3023 cup (orange and brown version) and two new shape 3618s prompted me to review my various coffee can shapes. In particular I'm going to have to check out Val's can in Motif pattern to check whether it is a 3022, which is what I took it to be when I first spotted it on "Crown Lynn with Valerie", or one of the other can shapes, 782 and 3618 (vitrified), or 3023 (earthenware). Some patterns were used on both cups and cans, but why they were used on a particular can type has yet to make any sense to me. The dates that the various shapes appeared may have some relevance so I have noted them down. The earliest of the cans, the 782, appeared in 1962 or 1963 and according to notes transcribed by Ev was "replaced" by 3022, 3023, and 3618 in 1968. The 3012 bevel bottomed cup appeared in 1965 and the similar 3019 "shape twenty-5" in 1967: the similarity of the shapes suggests that the 3019 would have replaced the earlier cup but I have not yet seen any document in support of such a claim. 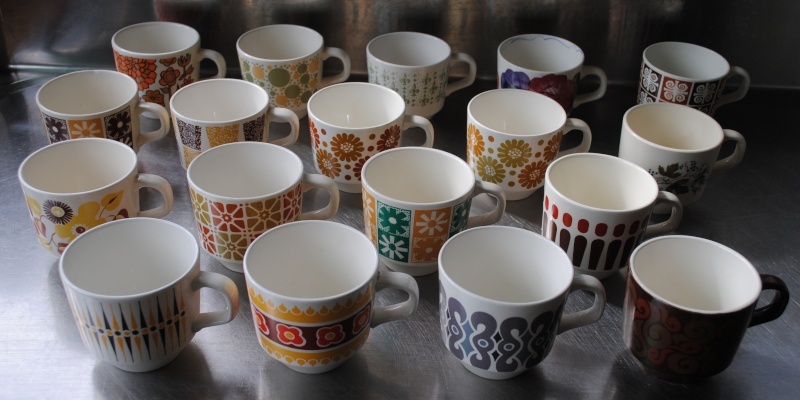 From the examples I have seen in janpots' 3012 and 3019 collections, patterns used on the earlier cup shape were not reproduced on the later cup, but some were reused on cans. First used on 3012 and later on 3022 or 3023 or 3618. As I have said, I need to recheck with Val which shape this is as I may have been mistaken in my original assumption that it is a 3022. Again note that although the pattern and colours are the same, as with Focus on 782, the transfers appear to have been applied upside-down on the can. In the photos below the colours appear to be different but I think that is just different lighting. Candy Stripe was used in (at least) three colour variations on 3023 cans. It may be a stretch to call it the same pattern but a very similar pattern or simply different colours can be seen on another of Jan's 3012 cups. I do not know what pattern name and number Jan's cup has. In summary some patterns used on 3012 cups but not repeated on the replacement 3019 cups were later used (in altered form) on coffee cans including 782, 3023 and possibly also 3022. That's an interesting observation J.
I now remember seeing an auction for Talahassee recently and even posting it. I may have got the spelling wrong as it was hard to read it as Talahasee. That may let that one off the hook, although it is remarkably similar to Candy Stripe. As for Conifer, I remembered and then forgot that during the course of writing. I will add a picture of it. Done. Did youall notice the upside-down transfer again? Thanks to janpots for naming the unknown pattern in the original post above. Although Talahassee is the correct spelling of the place name, the name on the backstamp appears to be "Talahass!" ending with an exclamation mark, and no "ee". 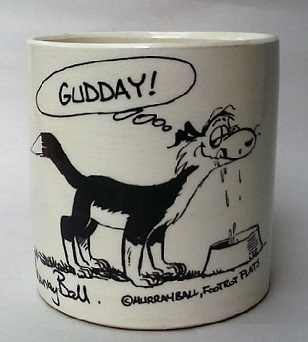 The backstamp also has the words "Distinctive Table Ware". When Crown Lynn introduced "shape twenty-5" in 1967 they added not just a cup but a whole new range of products and may have deliberately chosen then to distinguish the new range from the earlier 3012 cup which superficially appears to differ from the 3019 in the shape of its handle. Supposing that to be the case then the next question is did they choose to continue with the patterns by switching them to the cans, or was it simply a matter of using up transfers at a later time? To me the significance of the dates now becomes apparent, with the 3022, 3618, and 3023 being released just one year after shape twenty-5. Numbers of these shapes seen are so small that it seems unlikely that they were made over a long period.